Home / Tricks / How to Get Prepaid Virtual Debit Card in India ? Doing Worldwide Online Transaction but Stopped just Because you don't have a Debit Card or if you have Debit Card but not have the required type of Debit Card? Guys if this thing happened to you ever then don't feel sad now because I have the solution to this problem and today I am going to tell you about how to resolve this problem. Guys, this problem 's solution is Prepaid Virtual Debit Card. 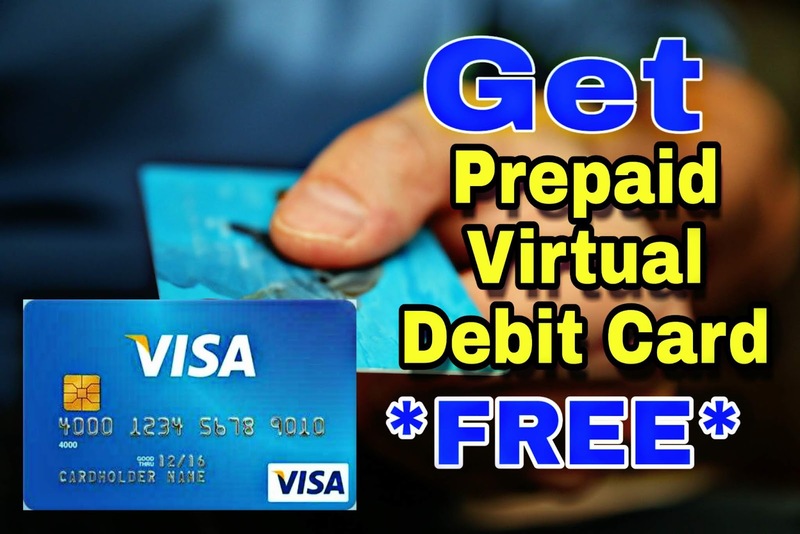 Yes, guys with Prepaid Virtual Debit Card you can easily solve your problem. If you are looking for a Prepaid Virtual Debit Card because today here in this article I am going to tell you How to Get Prepaid Virtual Debit Card in India? Now, first of all, some of you do not know about Prepaid Virtual Debit Card So let me tell you more about it. How to Get Prepaid Virtual Debit Card in India ? What is Prepaid Virtual Debit Card? Guys Prepaid Virtual Debit Card work as same as a physical Debit card but as these are Virtual Debit Card so you can use them only in an Online activity like Online Shopping, Online Transaction etc. They are also available for To Get Physical Card but you have to pay some money to get Prepaid Virtual Debit Card as Physical Debit Card. The major difference in Prepaid Virtual Debit Card and General Physical Debit Card is You don't need to open a bank account to get Virtual Debit Card. You can add money in these Prepaid Virtual Debit Card from your bank account and you can use them worldwide Shopping, Transaction and other works. So this is what Prepaid Virtual Debit Cards are. Now let's talk about all the topics why you need these cards. Why You Need A Prepaid Virtual Debit Card? Guys, Today's world is Digital World and most of the People prefer buying things online than offline. In India, a Campaign is Running named Digital India after this Campaign a lot of online wallet apps have come like Paytm, Phonepay, Freecharge etc. So, these apps help you with doing online transaction but they only help you with the national transactions. But Sometimes you have to do International Transaction then these wallets doesn't help you with the transaction. That time you need a Debit/Credit card to complete the Transaction. But from a few time, Indian banks are providing RUPAY Debit Card instead of Visa and Maestro Debit Card and Not everyone can get and afford the Credit card. So, at that time Prepaid Virtual Debit Card help you to complete the transaction. You just Need to add Money to these type cards and just use them like a normal Debit card. Not every site accepts RUPAY Debit Cards and wallets. So, for that time Prepaid Virtual Debit Cards are very important and the best thing about these cards is you can get them for free. Now you already know Why You Need Prepaid Virtual Debit Cards. so, now let's talk about how you can get these cards. How to Get Prepaid Virtual Debit Card? Guys as I mentioned in the title only in India because you have to be Indian to get Prepaid Virtual Debit Card because the method I am going to tell you about is required Aadhar Card which is only Indian People have. Yes, you just Need a mobile Number and an Aadhar Card to get Prepaid Virtual Debit Card. Guys you all know about ICICI Bank, their Pockets App is like Other Wallets App but it gives you free Prepaid Virtual Debit Card. yes, you read that right, we just have to create an account there. So, these are Some best Features of it is this is a product of ICICI Bank and you can trust them Blindfolded. Now move to our Topic How you can get Prepaid Virtual Debit Card, so let's start. Here I am going to tell you Step by Step How to Get Prepaid Virtual Debit Card? Guys First of all Download Pockets By ICICI Application From your Playstore/Appstore as shown Below. Now open this Application and Register it with your Mobile Number and On the next screen, you will be asked for your information. Fill everything Correctly by watching in Aadhar Card and then enter this Referral code by entering this Referral code you will get Free 10 rupees in your account. Now Click on Register and You will see Screen like below. you can check every Function and can be Familiar with this app. Now click on the above of the Screen and there you will see your Debit card Number and CVV and Valid Up to date. You can use it anywhere but before add some money in it from your bank account and Boom you got your Prepaid Virtual Debit Card. How to Use Keywords Everywhere tool on Android Smartphone ? How to Boost your Seo Ranking by Social Media ?